Sriracha is an amazing sauce. We’re a little nuts for it over here. In fact, I have it on good authority one of the sons is even getting a bottle in his Easter basket this year. This hot sauce can literally make anything taste better. Add it to some broccoli and you’ve got yourself an epic combination. I realize it may not look quite as vibrant or delicious now, but that’s just what soy sauce does to broccoli. It turns it brown. This saucy side dish may not be all that much of a looker, but rest assured, she’s got it going on! While skinny on the calories, this Asian-style broccoli is full on flavor and packs just the right amount of spice. 2. Cut the broccoli from the stalk into small florets and wash & dry well. 3. In a large bowl, mix all the seasonings and diced garlic together. 4. Coat the broccoli evenly. 5. 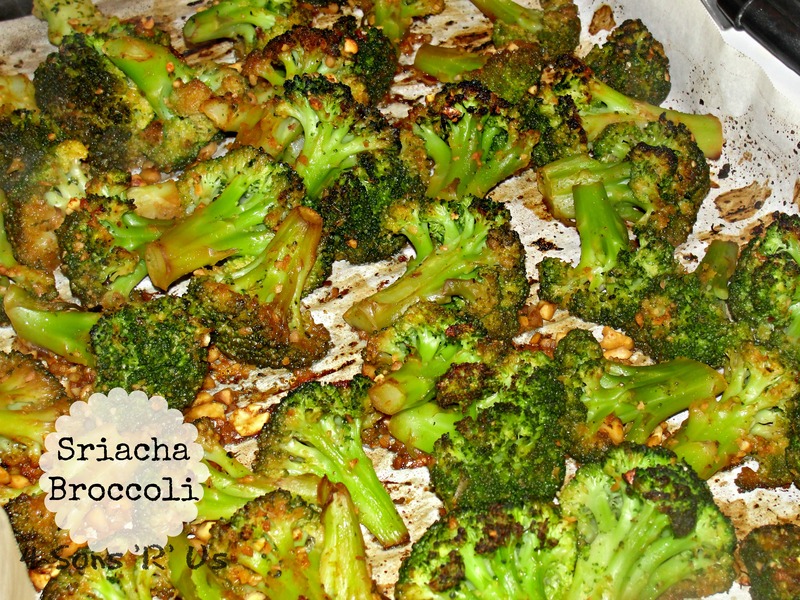 Put the seasoned broccoli onto a baking pan with a baking sheet, or parchment paper, under the broccoli. 6. Bake for 15 minutes, but remember to toss it half way through. 7. Serve with extra crushed peanuts on top!